just to visit each other from time to time. It is well worth attending one of the gathering if one is near. If you do, you won't want to miss a single gathering from then on. Patti Gibson and her husband were folks that started the "huggin", usually at all our gatherings as well as some of their own traveling from place to place. See her photos of EFFORTS folks at http://www.pattigibson.com/album.htm Scroll down the pages to the state names to get all the pictures For those who remember her, Patricia (Patti) Anne Bailey Gibson died 8 September, 2006 of 'Respiratory Failure due to Chronic Obstructive Pulmonary Disease'. After many years fighting pain and difficulty breathing she settled back in her recliner chair, relaxed and drifted into unconsciousness. CPR and the soon arrived 911 EMT personnel were not successful this, the 5th time. Current reunions are by date at the top, and then list those that have already occurred at the bottom. In short, this will be shown as a Calendar of Events. 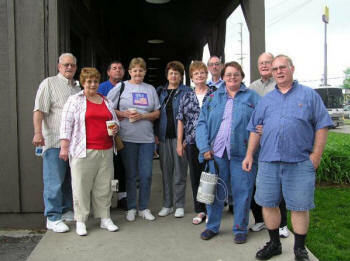 To post your EFFORTS Gathering, please send information to Linda Watson, lwatson@hvc.rr.com . You are invited to attend a meeting designed to educate and support people living with alpha 1 antitrypsin deficiency/COPD as well as their friends, family and community. Please join us as we offer general support and resources, share information and learn about these conditions. Special Guest Speakers : Cindy Pohl, Gail Moreno, Julie Lowden & Pete Zipple Registered Respiratory Therapists, Sparrow Hospital, Pulmonary Rehab Dept. The ALPHA 1 AND COPD Resource Group Meeting was held Sep 15. It was designed to educate and support people living with alpha 1 antitrypsin deficiency/COPD as well as their friends, family and community. Dr. Kyle Hogarth, an expert in pulmonary diseases to include Alpha 1, was the featured speaker. 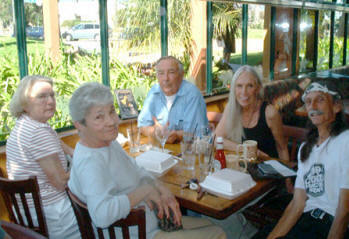 Kissimmee, FL Wonderful food and great company were enjoyed by all. "We're planning to do it again in January - come on down!!" Please watch for the announcement of the next one. The ALPHA 1 AND COPD Resource Group Meeting was held March 26. It was designed to educate and support people living with alpha 1 antitrypsin deficiency/COPD as well as their friends, family and community. so please watch for the announcement of the next one. DECEMBER 7, 2006, 1:30 p.m.
the name and face together. 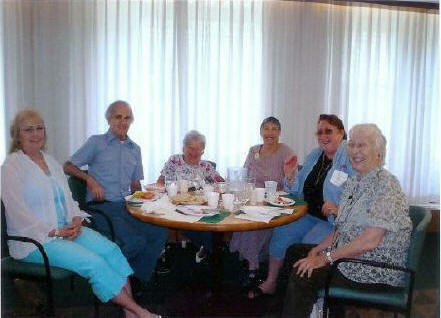 The time is now for us to get together to have lunch, socialize and make new friends. Sunday Dec.10 at 1pm at Simon's Restaurant .2 W Roosevelt road in Villa Park Il. We need your reservations now to make it a sucess. This is not limited to just those living in the South East. Any one who can get there is welcome to come. There has been a lot of interest in getting together in No one has objected to the . Now for question # 3....do you want to have a speaker? Savannah has several places to stay. I-95 & 1-16; Abercorn St (or Hwy 204) the downtown area, and the beach. The least expensive are at 1-95/1-16 and on Abercorn St. For eating, there's Lady & Sons, Mrs. Wilkes (all you can eat, great food), the Pirates House, and many places for seafood. It's a very easy City to get around. Streets go N/S and E/W. There's River Street for shopping and eating, several historic houses to tour and even driving tours. The beach is 30 minutes away. There's two forts for history buffs. There's also a riverboat tour. So first things first....speaker? Let me know and if any others would like to come, please do......these are lots of fun. Mary Ellen-Ga.
Would those of you who know you're going to attend, please send me an email so that I can now start making plans. There are many nice eating places, Italian, Mexican, Steaks, Seafood, country cooking, etc. Let me have an idea what you'd like. Can't promise to please everyone but sure will try. There are many places to see in Savannah and I'll try to find out more about them. If we have enough people we might be able to get a group rate on the motel. Set your calendar to DEC 1-3, 2006. Mary Ellen-Ga.
area in a restaurant that has a room for meeting and we could talk and get acquainted. Greenville, Spartanburg, Anderson---and certainly some of us from the upstate would love having a gathering down around Charleston, Myrtle Beach! If interested please let me know off list. me. Thank you, thank you, thank you!!!! Elvis has now left the building. get together for lunch & then plan from there. Inn) or open for suggestions. The attached photo is a first Wisconsin EFFORTS Gathering. We found each other from the list. 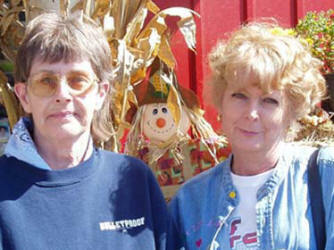 From the left is Ione Driggs, Pat V. (sorry, never found out her last name) She lives in Cedarburg, WI and Joanne Weber. 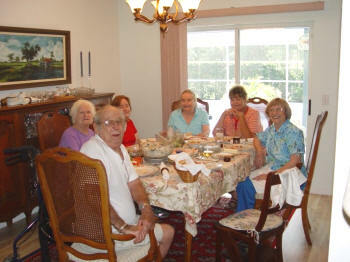 We had a very enjoyable lunch and hope to do it again in October. It was nice to see faces to match the names. to meet some of the local members. We did our best to round up a few in a hurry. with Suzanne Suzanne6@concentric.net let her know I am looking for her please. Please email me if you would like to attend so we can be sure to have sufficient seating. I've had several calls requesting a gathering in September, so I will try for the Greek Islands again. downtown Chicago.They have free valet parking at the front door. Come and meet some good people and make friends. A good time will be had by all. more members to attend the next meeting. at Liberty Tree Mall will work out for just about everyone. Looks like a good group. The Yorktowne Hotel in York , Pa is our meeting place. For those of you who are planning to stay the night , they have given us room rates of $99.00 per night for two people. 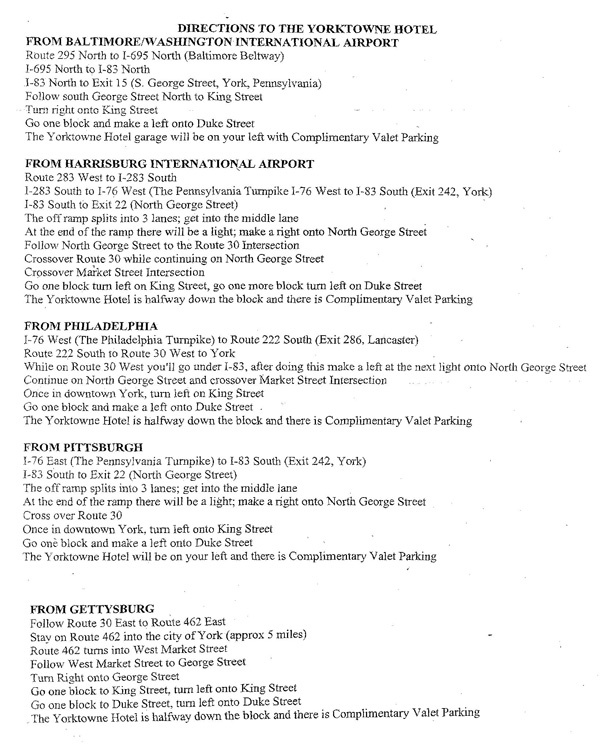 York is a busy town and the Yorktowne is one of the favored places so room reservations are requested as soon as possible in order to get a room and especially a non- smoking room. We will have a delightful time. I am so excited to meet you all. I would, at this time like another idea of those who will be attending. I must give this info to the hotel. And again the date is Thursday, June 23, 2005 from 11:30 a.m. to 4:00p.m. If there is anyone else who thinks they may like to join us, please contact me at your earliest convenience. There will be further updates as we get closer to the date. We should have a speaker that day. Thanks, we would love to meet you! came to Mich. We met at the Macaroni Grill in Livonia for lunch. had a lung transplant, and Paula was wearing the much talked about Oxy glasses. I think we all talked more then we ate!! Mary had her little dog with her, she is precious. 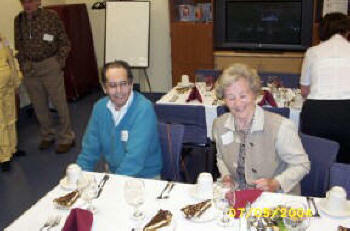 We are planning our third annual luncheon in Randolph, Ma. it has always been most enjoyable for those of us who could attend. We have fun seeing one another and just plain talking. You have your choice of; tuna egg or turkey all sandwiches with tomato, pickle, potato chips, coffe or tea and dessert. All for $4.00. More on that as the time approaches. The date has been secured and it is May 17th,.....11.30 to1.30 or so. All surrounding states are certainly welcome to join us. Make your reservations early. Looking forward to another fun day. 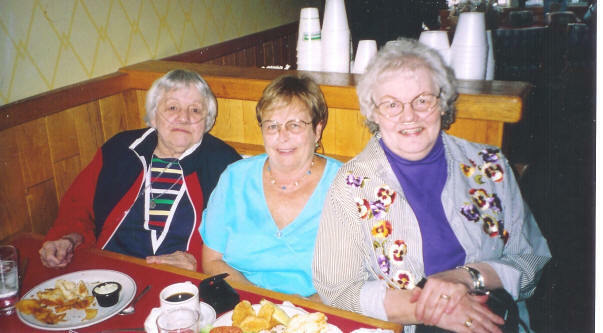 Judie Aguire, Lloyd Corrigan, Eileen Corrigan and Mary Ann Jollay. 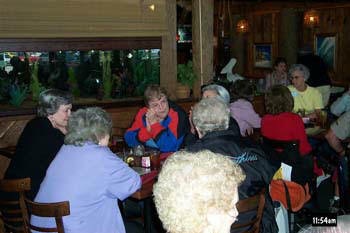 We had a very pleasant gathering at the Glenwood Oaks Restauraunt in Glenwood, IL with our spouses. Title: Helpful Strategies to Manage your Shortness of Breath. 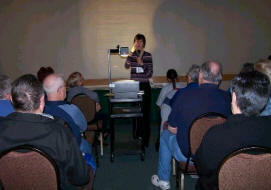 They will provide an overview of COPD and the causes of shortness of breath. They will offer strategies to help the person with COPD manage their shortness of breath as well as exercise, medications, breathing techniques, and others. Sharon at familien1@WAVECABLE.COM for more information. Burlington, MA. We have this every other month. meet them in Joplin for lunch. Mary says she was lucky that she agreed. 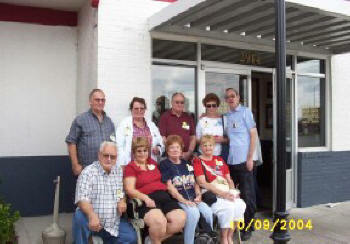 So, the picture below was taken in Joplin at the Bob Evans Restaurant on 3 October 04 on my way to Barnes. truly a "neato" lady and I feel lucky that she has been "in my corner" all these months." 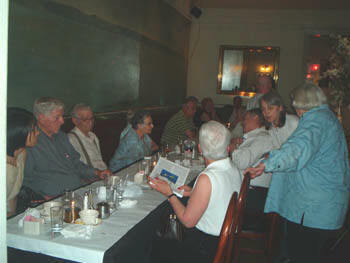 On Thursday, September 30, 2004, a group of EFFORTS members gathered at Pasta Fresca in Seattle to enjoy a terrific meal and exchange experiences in living with COPD. Bill Probstfield, author of "Smell the Rose, Blow Out the Candle," and his wife, Janet, were in town from their home in Oregon. Bill just finished his final evaluation for a lung transplant at the University of Washington. Also present were Sandra and Larry Howard, Mark Kagi, and Karen Beeson with her partner, Vince Ferriols. Mark demonstrated his Segway as a simple and unique transportation device for COPD patients and said some insurance companies will now pay for them. We are having it tomorrow Wednesday, September 22, 2004 at the Elephant Bar in Goletta. All are welcome. 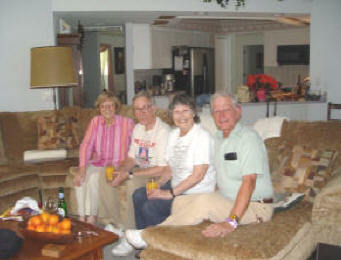 Pat Bryman, Ken Scott, Joann Daley, and Don Perry. center and Chris is wearing his Oxy-View glasses, sitting beside a rented Air-Sep Lifestyle portable concentrator! Ann Lornie is on the right side. and 11th. Phone number is 1-800-465-3069. You can look on the main page and click on family gatherings to see a picture of the Inn. inn on the gatherings page. It is on the first Tennessee gathering. We will have a luncheon gathering at The Club House Restaurant-298 Oak brook Center,Oak Brook,Ill,on Tuesday Aug.24th. We will meet at 11:30,so we will beat the parking rush. There is valet parking if you want to pay. downs and get to know each other. The cost will be 26.75 for lunch tax and tip included. Please let me know if you are interested in coming by Monday 7/19/04,so I can make reservations..
23+ miles South of Lexington. Approx. 100 miles from Louisville and Cincinnati, OH. know if you can make it. This will be a lunch ( Dutch treat) with a few interesting speakers. I need a head count by July 10th to reserve the banquet room at Ryans. about the stem cell issue and generally how we are all doing. As the pictures show clearly we are all still fine. COPING & CARING Workshop on Monday, June 28th. main entrance or you can park in the main parking lot for $2. Coping & Caring is a one-day workshop for adults with lung disease and their caregivers. Large diced cucumbers, roma tomatoes, black olives, julienne purple onions, mixed with feta cheese crumbles, olive oil, red wine vinegar, fresh oregano, chopped garlic. Served on top mixed greens. Marinated chicken breast seared and julienne on top mixed greens and cabbage, snow peas, carrots, julienne red peppers, mandarin oranges, bamboo shoots, water chestnuts. Served with an oriental dressing. Chopped iceburg lettuce topped with bleu cheese, chopped bacon, avocado, diced tomatoes, diced chicken, diced hard boiled eggs. Served with your choice of dressings. · Nice assorted variety of a chef gourmet breadbasket. May 18th. Lunch to be served at noon and then we can enjoy each other's company. we were well fed by the Chef for a very reasonable amount , served by volunteer residents. Obviously, we have to let them know in advance. I will check with the Chef and find out what he can offer. Simon C. Fireman Community ..but the location is the same, Randolph. Ma. PLEASE SEND IN YOUR RESERVATION. We all have a good time each year. local areas are welcome. Signups are needed because the room only holds 50. A small gathering but a gathering just the same. Gathering of 3 (Joy, Marsha, Linda, caregiver for Marsha). Small gathering, yes. Also, yes, I really do like my "real me" photo (Joy) you already have up! I have made arrangements to have our gathering at my hospital, where we met the last time. This will be our second Ohio gathering and I hope to see many new faces. It will be held in Findlay, Ohio at the Blanchard Valley Regional Health Center on Friday, May 7 at 11:30. Come prepared to have a delicious lunch. I will have the cost of that after I meet with our dietitian. She did a fantastic job for us the last time. Please let me know if you think it would be possible for you to be with us for that day. Look at the pictures of our last gathering at http://www.effortsmembers.org/gatherings.html and you will see some happy people having a good time sharing the day with their EFFORTS friends. If you are new to the group, don't be shy. I will do my best to find buddies to ride with if that would be a problem. Right now, I am looking for someone near Dayton to share a ride with a newbie. This isn't restricted to Ohio. We already have Ron Cook of Atlanta and Pam DeNardo of Illinois making the trip to be with us. 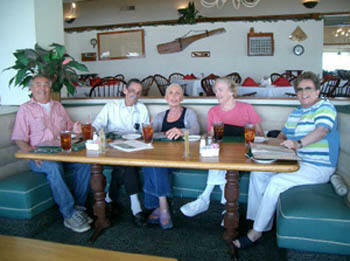 Well we are all set with the Lobster Trap Restaurant in Oxnard (Ventura County) for 12:30 PM on Wednesday May 5, 2004 for up to 8 persons. Should there be more people later on I will simply call the Restaurant with a revised number. The Lobster Trap has no problem with anyone using oxygen so we probably don't even have to mention that. When folks arrive all they have to do is ask for the EFFORTS group and they will be shown to our table. 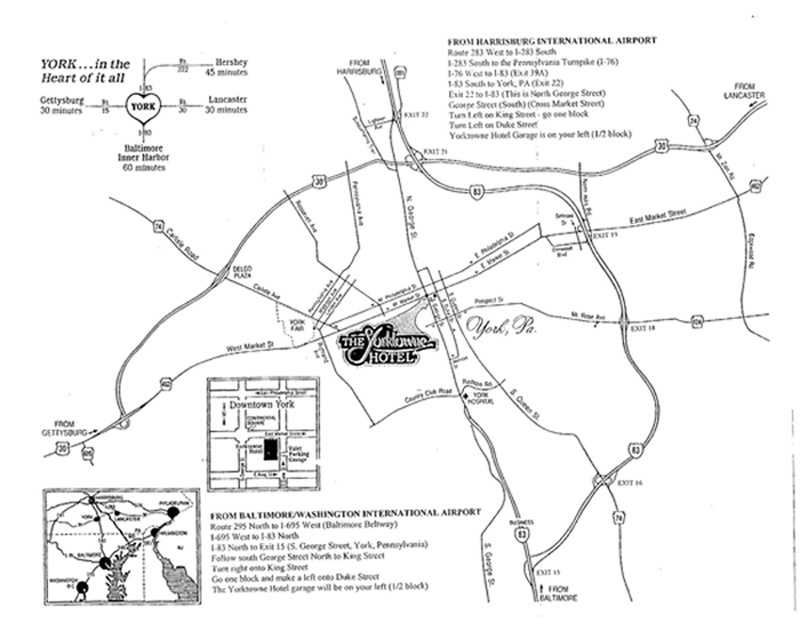 Folks can visit the websites below for information and driving directions or simply use MapQuest or Yahoo maps. April 29th: Cookout at the lake behind the motel. April 30th: Lunch at Shoney's Restaurant Exit 1 at I-75 North 12:30. Speaker: Apria Representative will speak on "Oxygen and Travel"
260 Pantops Dr., Route 250 East, Charlottesville, VA just on the eastern edge of Charlottesville. They have reserved the banquet room for us, even though only 5 or 6 folks have shown interest. an accurate count prior to that date. joins us, but would love it if others would attend too.